Girls, Get That Glassdoor Account! *Only using “girls” for playful alliteration purposes! I’d recommend much of the advice in this article for guys, too. With the non-passage of the Paycheck Fairness Act, it’s more important than ever for women to know their worth and fight for the same pay as men, one job at a time. Obviously, the people who have been elected to office are more interested in pleasing a base rather than doing what’s right … anyway … let’s look out for ourselves since our legislators won’t do their jobs. Despite the academy’s claims to be a forward-thinking meritocracy, female academics are suffering from the same pay inequalities as hamsters. Newsweek reported that female academics don’t make as much as male academics (Hat Tip: Worst Professor Ever): “… female faculty members have made no progress at all and have actually regressed. In 1972 women teachers made 83 percent what male faculty members earned; today, they’ve lost a cent for every dollar, earning just 82 percent.” That’s inexcusable–especially since salaries for professors at public schools are so easy to look up. So, want to get paid as well as your male counterparts? It’s time to make like a negotiator, and it’s easy. 1. If the job is for a public school, look up the pay in a database. Local papers usually have handy salary databases for all public employees. For example, the Contra Costa Times has a salary database for the state of California. 2. If the school is private, go to glassdoor.com. Professor salaries are up there; just look up the name of the school. For even more information, try salary.com. If the information lines up, you should know exactly what you can get. 3. If you are offered the job and salary comes up, have a number in mind. Penelope Trunk advises that you should make the prospective employer give the salary number first. Sometimes, that’s not easy. Whatever your situation, do not short-change yourself. You should be making about the same as what everyone else is making–or more. 4. (the hard part) If you don’t get the salary you want, don’t take the job. Obviously, if you are a poor grad student in dire financial straits, I’m not going to judge you if you do take the job. The only thing is that these universities know bloody well how broke and desperate you are, and you shouldn’t let them take advantage of you. You should push for every penny you can. As for anyone who is reading this blog who is employed, male or female, do your female colleagues a solid and share your salary on Glassdoor or leave a review of the company. (No, I’m not doing any shilling for them; I’ve just found what’s on there extremely helpful.) Until a Paycheck Fairness Act actually passes (don’t bet on it), then we have to help each other. 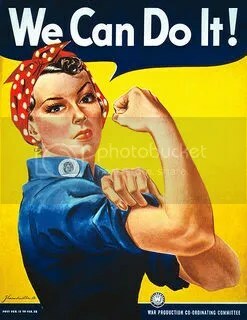 The We Can Do It! poster. What else? From Wikimedia Commons, public domain. Subscribe to comments with RSS	or TrackBack to 'Girls, Get That Glassdoor Account!'. Great advice, Caroline! It’s always nice to have some practical tips in the face of annoying political non-action. And to be reminded that in the outside world, salaries are pretty much always up for negotiation.